Pentel generously sent me this handsome pen and pencil set known as the Libretto. The pen is a .7 mm and uses the popular LR7 refill, known for high-contrast, consistent, quick-drying lines. The mechanical pencil is a .5 mm size and has a retractable tip, making it safe for pocket carry. As far as design, the pen and pencil are all metal; they feel well balanced without being too substantial. A small star pattern circles the band around the barrel and a small Pentel logo is just above the band. Other than that, it's all low key. Curiously enough, the clip on the pencil has a bit more spring to it than the pen, but both are easily to remove from a pocket without snagging. I mentioned that the pen uses the LR7 refill, which can also be found in the EnerGel line of pens. If you've tried EnerGels, than you probably agree that the ink has some of the best all around properties available. The pencil comes loaded with Pentel Super Hi-Polymer leads - they are resistant to breaking and perform well. In the ergonomics department, the pencil allows for a bit more variety in finger placement, at least in terms of writing closer to the point, which I tend to do as I write rather small. The pen has a proper grip (rather than just holding onto the barrel) and it not too squishy and doesn't seem to attract too much dust, as some grips tend to do, but having a cap certainly helps. Speaking of the cap, it clicks firmly on both sides of the pen, which I love. The Pentel Libretto Pen and Pencil can be purchased directly from Pentel and currently retails for $39.95. Given the build construction, quality, and overall lack of any real flaws, I think the price is well worth it. If you're looking for a classy writing instrument gift for the Holidays, the Libretto set would be a fine choice. "My entire family are pen freaks. I am currently in Medical School and need some pen, highlighter and marker advice. Currently in school my got pen is the Black Pilot G2 0.38MM for daily note taking and I use the Staedtler Triplus Fineliner 0.3MM to add color to key pieces of information in my notes. I also like to use a standard sharpie yellow highlighter as I review my material. I am looking for a pen line that offers me the options of colors so I would not have to use the Triplus anymore and the rights as fine or finer then the G2 0.38MM but also has some coolness to it. I have tried the Jetstream 0.7MM but i still dont get the satisfaction I get with writing with the G2. Any options or just a top 10 recommendation of pens would be great. Do you have any recommendations on highlighters also nothing that will smear?" Last year, I received the DP Leatherworks Utility Notebook cover for Christmas, and I had meant to provide an update at some point down the road to show how well it has held up. Well, just under a year later, and I'm happy to report that it is in very good shape. Sure, it has been weathered a bit by fingernails, hitting my belt being removed my back pocket, and other general wear and tear, but it is just as soft and supple, and now it has a little more character to distinguish it as my own. The big gash down the front is from my fingernail. All of the scuffs at the top are from trying to retrieve the notebook with my man pincers. I wouldn't say I have claws or anything, but I will acknowledge that it's easy for me to open an orange. The back has less character - just some general wear from sitting on it in my back pocket. I did notice that sitting on the cover ended up pulled on the staples of the notebook a bit much, so I recommend wearing this in a front shirt pocket or carrying this in your bag, unless you burn through a notebook fast enough for it to not be an issue. I average two months per refill, but it doane of Field Notes, so it's at that point that the binding starts to wear thin. Your mileage may vary. The inside, however, is pretty much good as new. I don't see any reason why this would get really worn out unless you are using it outside, in the field, or in extreme climates, otherwise it is nearly the way it was when I acquired it - good stuff. I picked this one up JetPens last year, but I just now got around to reviewing it. What struck me as interesting about this one was the .3 rollerball refill and the ability to use brush refills, too. The barrel and brush refills come in a variety of colors, or you can use a .3 rollerball refill in black, as I opted to do for my configuration. Here is the refill, which is quite sparkly, as you can see. I thought the .3 ball would be a bit finer, but this is a liquid ink pen, so the final line width comes out to be a bit closer to .5 mm. What bothered me the most was the inconsistency in ink flow. At times the line would be thin and the ball was dry and somewhat scratchy. The ink would then start flowing and leave thicker lines on the page, which made the think lines seem even thinner. If you look at the word 'inconsistent', you can see how the letter 'I' is faded at the top and thicker at the bottom. The pen didn't perform poorly all of the time, but it was enough to bug me. This pen is called the ZIG Letter Pen, and I cannot say that I would recommend using this for writing a letter at all. I think the brush refills might work well for calligraphy, but I have not tried them as of yet. Given the ink flow issues on the rollerball refill, I am not a huge fan of the ZIG Letter Pen, but I think it might work well for sketching. Sparkles or not, I wasn't dazzled with this one. Congratulations, Tim! Send me an e-mail with your address, and I will get the goodies in the mail. If I do not hear from you within one week's time. I will draw a new winner. Thank you to everyone for submitting entries. I will have more giveaways coming up! While I greatly value the readership from foreign visitors, this giveaway is limited to U.S. residents only (shipping costs and issues with Customs being the reason). - and leave a separate comment on this posting saying that you have done so. Any duplicate comments or tweets will be disregarded. The deadline for this giveaway is 12:00pm, CST, on Sunday, October 14th. I will post the winner the following day. Good luck! Shoplet.com recently sent over a little variety pack of office supplies to try, with all but one items being new to me. Because I had never seen them before, I started with the Pilot BE GREEN Dry Erase Markers. The BEGREEN aspect of this item refers to the fact that these markers are made with 91% recycled content. What's more, you can also buy a refill for Pilot Be Green markers and refill them up to four times which, according to Pilot, will result in a 39% savings over traditional (non-refillable) markers. I'm all for environmentally friendly products, and any opportunity to save money is more than welcome, so I think this product is brilliant. Pilot is also a sponsor of K.A.B. (Keep America Beautiful), an organization that promotes primarily promotes litter reduction and recycling. As it stands, +1 for the VBoard Master markers. The markers are refillable via these little ink cartridges that are installed at the end of the marker. In terms of 'green' and environmentally friendly, I couldn't help but wonder if the wrapper was necessary. There's no indication that the wrapper is recyclable or biodegradable, and I think that it should be if it isn't already. On that same note, the plastic box that the markers are packaged is also void of any recycle symbol or bio-degradable indicator. In a future revision, I would like to see one or other on the cartridge wrapper and box. As for the ink, the ink was as vibrant as most other dry erase markers I've used, and the flow was as one would expect - smooth and even. The ink erased easily without ghosting or leaving color flecks, as some markers tend to do. The large chisel tip allows you to write in fine or bold lines, or with a calligraphic expressiveness, if you prefer. All of the dry erase markers I currently own have a chisel tip, so this is what I prefer, if only due to familiarity. According to the product cut sheet that came with these markers, you can also get a bullet point tip if you prefer that over chisel tips. The cap of the markers has a little nub on one side to prevent the marker from rolling off, and the overall size of the marker allows for comfortable writing. If I have to stand at the white board for a while, it's nice to have a marker that will not result in hand fatigue. So, what do I like about these markers? It's really pretty difficult to find any fault with these markers at all. I would like to know how green the packaging is, but compared to any comparable product, these are probably the most eco-friendly dry erase markers available. Plus, they write well, won't roll of a flat surface, are comfortable to hold, have vibrant ink, are refillable, and have two different tip styles, making them the most well thought-out dry erase markers I have seen. Hats off to Pilot on this one. The second item I wanted to try is the Pilot B2P Recycled Ballpoint Pen. I've seen the B2P gel at stores and online, but I wasn't aware that a ballpoint version was also available. This pen, like the VBoard Markers, is made of recycled materials - 90% in this case. The B2P names means 'Bottle to Pen', referring to the recycled bottles were used in the construction of the pen. If it works as well as it's non-green counterpart, I'm all in. This is a retractable,1.0 mm ballpoint (the standard for most ballpoint pens, at least in my experience) with black ink. The barrel itself resembles a water bottle and it an appealing light blue color. The grip is grippy and comfortable, as it is should. The retractable mechanism has a pronounced clicky action to it and does feel flimsy or loose. With a 1.0 mm ball, the writing action was smooth, but the ink was fairly standard in the realm of ballpoints. It's hard to tell in this writing sample, but the Pilot EasyTouch Pro and Uniball Jetstream were superior to the other three examples. I'd say the B2P was the third smoothest and darkest, followed by the Zebra Z-Grip, and the Bic Atlantis was easily the last place performer. If I could change one thing about this pen, it would be that it uses the EasyTouch Pro refills rather than the refill it has now which, if I were to guess, is probably the regular EasyTouch refill. Likes: The B2P ballpoint made from recycled materials, is comfortable, feels solid, and looks good. Dislikes: The ink is middle of the road and could use improvement. It's not bad by any means, but it's certainly not great. I'm fairly certain the next pen does not require any sort of introduction but, if you haven't seen this before, this is the Pilot G2 Gel Roller Ball Pen, quite possibly the most popular gel pen on the planet. I first saw these about 12 years ago, when I was in high school. Since then, Pilot has released other tip sizes (.38, .5, .7, and 1.0). You can get this pen in the regular (shown above), or pro version, and you can get it in a fairly wide variety of colors. There are mini versions, large barrel versions (the G-6), and the B2P gel also takes the G-2 refill. I'm sure that I am missing several other variations of the G-2, but you get the idea - it's a big player in the gel pen world. One characteristic of the Pilot G-2 ink that I've always loved is that the ink is jet black; it doesn't get much blacker than the G-2, though the Sarasa was close (it's hard to tell what the opacity levels are in this image). A downside that many people have noted on the .7 and 1.0 G-2 refills is that the ink takes a considerable amount of time to dry. The result it that it smudges and smears, but I don't typically experience this with my .38 and .5 mm G-2s. The barrel itself has been the same since the beginning - you get a reliable clip, grip, retractable mechanism, and a pretty durable, translucent barrel. I personally wouldn't mind a revision to the barrel, but it might be hard to mess with a design that has served so many people very well over the years. I have had periodic issues with the writing performance of some G-2s, but it seems like it has been a while since the last occurrence, so I am wondering if there were a few quality issues in previous batches. One small point of interest: I think all of the G-2s I have purchased in the past have had an orange tint to the lighter gel behind the black ink, but this one is more of an off-yellow. Does anyone else have input on this? The G-2: An industry leader of gel pens. A modern classic. Room for improvement? I guess it depends on who you ask, but I'm just excited that the micro tip sizes came out. I would love to see this available in a needle point like its cousin, the Hi-Tec-C. Anyhow, there's not much that I can say about the G-2 that hasn't been said already, but one of these has been in my pen cup for over a decade, and it's because this is a easily to find, reliable, well-performing pen. Next is the Pilot Frixion Point Erasable Gel Pen. The pen utilizes thermo-sensitive ink to provide the option of being erasable. The 'Point' version has a needle tip, but you can get the regular Frixion, too, which is a conical tip. I've tried the regular Frixion before and thought it was quite good, though the black ink appeared a bit washed out - more like a dark grey. For a blue ink, I thought this was an excellent color, almost a ocean blue. You can see in this writing sample that the ink is abit darker than cobalt or Zebra's standard blue, but not quite a blue black. I guess it would be fair to put this more in the denim blue range. The writing performance was very precise, consistent, and enjoyable. I love the needle tip on the Frixion Point, and I plan to acquire more of these as I tend to make mistakes. The 'erasing' is done by way of the little knob at the end of the barrel. If you like to write with your pen posted (cap on the back), you will have to remove the cap to use the erasing nodule. I'd prefer to have this on the end of the cap since I tend to write with the cap posted on the back, but this preference might not be universal, though I think it makes more sense either way. The point size is indicated, too, as 05 on the side of the barrel. As for the design on the barrel itself, it's a bit wild for my taste, but I typically lean towards a minimalistic design approach. The grip is subdued in appearance but works well. I found the comfort of the pen to be solid - no real complaints. The needle point feels solid, and based on the durability of the Pilot Precise, I'm confident that the pen will easily last until the ink is gone. I was also sent a Frixion Light Erasable Highlighter, so I did the writing sample of the Frixion Point and the Frixion Light together. But, before the sample, let's take a look at the Frixion Light itself. As you can see, the barrel design primarily yellow, as are most highlighter with yellow ink. The design is also similar to the Frixion Point in that it has a tribal design on the barrel. The combination of the black and yellow makes it look aggressive, almost wasp-swarm like. Worried about highlighting in those expensive text books? It's erasable, so you can highlight key areas and erase it again. Highlight something on accident? No worries. Rub it away and relax. If you want to erase the highlighting of the Frixion Light off of the Frixion Point, then you will end up erasing them together, so keep that in mind. So you can see how effective the erasing is, I wrote a line with the Frixion Point, a line with the Frixion Point highlighted with the Frixion Light, and then drew a line with the Frixion Light. Using the eraser end, I rubbed a few diagonal lines across the writing sample. As you can see, both inks erase quite well. There might be a little bit of ghosting, but it is very light if at all, and the amount of effort is nominal at best. The chisel tip is shaped well for covering most lines of text in the typical font sizes. The tip didn't have much give, so I'm assuming that the tip will hold up well over the life of the highlighter. What do I like about the Frixion Point and Frixion Light? The writing performance leaves nothing to be desired in both cases - smooth and consistent. I like the barrel shape and overall writing comfort. Erasable ink is a very cool feature, and I think a lot of people could benefit from a second chance in their writing and highlighting. The durability of both of these products is evident in the feel and in Pilot's reputation. What don't I like? The barrel designs are a bit loud, a bit busy, so I'm wondering if a 'pro' or 'executive' model of each of these might be released at some point. Neither of these, as far as I know, are erasable. Pilot has taken the initiative of making several eco-friendly products, and it would be nice if these were a part of that agenda, too. All in all, it was a great time to try all of these products. With the exception of the B2P ballpoint, which could benefit from a different refill (EasyTouch Pro refill), any of these would be an excellent addition to your arsenal of writing supplies. Please let me know if you have a different opinion, feedback, or questions about any of these products, and thanks for taking the time to look through the review! This is the 2013 Daycraft Executive Diary (planner), in brown. The cover is made of a high-quality polyurethane, or imitation leather. You'll notice the diary is secured with an elastic strap that secures to a knob on the front of the book. The good thing about the way this strap secures is loose items that are stuck in the planner are less likely to fall out, and the pages of the diary itself will not get crumpled up due to the planner accidentally opening in your bag or purse. The downside to this type of securement is that the knob on the front cover sticks out a bit, so it will fit awkwardly next to other books on a shelf and may end up scratching them or leaving indentation marks, so keep that in mind. As for the paper, I do enjoy that it is a similar color to the cover, and most of the Daycraft products I have seen tint the paper so it looks more interesting from the side. The Daycraft Executive Diary is a bit thicker, allowing for a page-a-day format with time slots. I personally don't like when time is included in the formatting, because I might have a number of things to do in one hour and have the rest of my day open. Obviously this is personal preference, but I tend to go for the more organic approach. Outside of the page-a-day views, there are also month-at-a-glance pages to help you plan for larger projects and events. I like the layout of having the lines above the calendar rather than having little boxes with the date, like many planners often do. There are several motivational quotes throughout the planner, but I wanted to share this one as it is the one that stuck with me the most (and it's great advice, right?). The paper itself is thin, but it holds up to a variety of mediums pretty well, though show-through is significant. I recommend sticking with a pencil, ballpoint, or micro-tip gel. Various information pages and reference material is also located at the beginning of the book, which you can see in my recent review of the Daycraft Animaland Diary. On the spine is the year of the planner, which looks great, but there is the aforementioned issue with the knob for the elastic band. At any rate, the Daycraft Executive Notebook has a lot going for it, and it is available is also available in a pocket version. This is the A6 size, and it goes for ~$30.83 (U.S) as of 9/15/12. 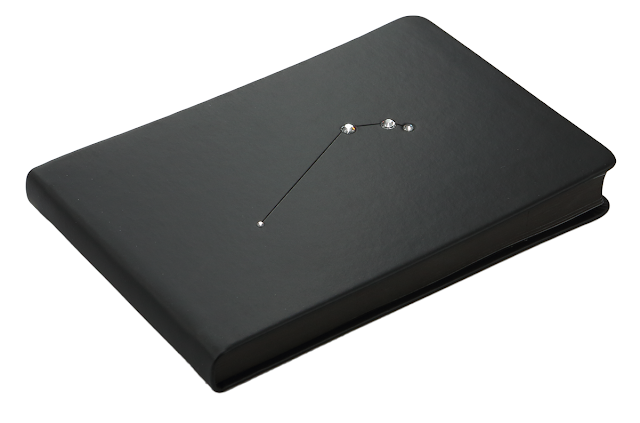 Next we have the Daycraft Astrology Notebook with Swarovski crystals. The one I have is for Aries (March 21st to April 19th). I love the black cover with black pages, allowing the crystals to literally shine off of the cover. The cover is made of a high quality polyurethane, which has its own sheen. Between the crystals and refraction of the cover, I did have difficulty in taking pictures, but I cannot fault the notebook for this. On the first page of the book is a plastic insert that shows all of the different star clusters that relate to a zodiac sign. I honestly didn't know what they looked like, so I thought this was a nice touch. On the pages is a star-grid patter, similar to Rhodia's Dot Grid style, but each of the points is a little plus sign which I believe is meant to reflect the star/astrology theme of the notebook itself. The paper itself is exceptionally smooth and much thicker than than the paper in the Daycraft Diaries. You get 88 sheets (176 pages), and the paper is white in color (though it looks a little darker in the photo). Given the theme of this notebook, I think it would make a great dream journal or book of aspirations. Regardless of what the notebook is used for, the notebook feels like it should hold the contents of something special. At $299 Hong Kong dollars, or $38.57 U.S., this notebook is a bit pricey, which is another reason to use it for something worth the price. Many thanks for Foreal Lee for sending out the samples to review!